One of my favorite things in the world to eat is toffee. Not just any toffee, but the homemade Christmas toffee I make. Nearly two cups of sugar, 1 ¼ cups of butter, this year I added chipotle…you get the point. I typically make the toffee only at Christmas because…well, I’ve only ever made it at Christmas. When the toffee is around it is hard for me to eat responsibly. I eat piece after piece whenever I want it. I know that with my disordered eating I need to eat at certain times of the day …7:00, 11:30, 3:30, 7:00 and 9:00 pm. (give or take 30 minutes on either side) When the toffee is around, I will break that schedule tricking myself into thinking that because it is a “special” food, I can have it whenever I want it. It has a Christmassy glittery shimmer that screams…EAT ME NOW BECAUSE YOU HAVE TO WAIT A YEAR TO HAVE IT AGAIN!!!! 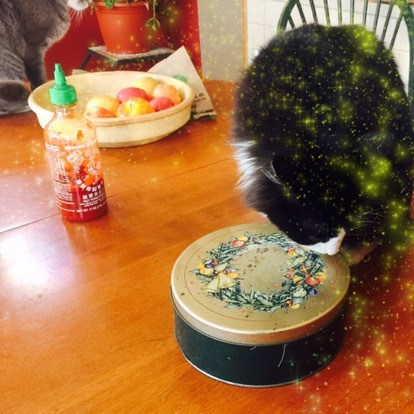 Even Watson the Cat can’t deny the glittery spell of my Christmas toffee. Trying to debunk the “this is only a Christmas food” myth, I made the toffee again a couple of weeks ago for a dinner party. At the end of the night I gave the remaining toffee away. I was proud that I was able to let it go to another family; it needed a good home. Apparently the toffee didn’t appreciate our breakup because it returned to me this weekend. (how that family I gave it to didn’t finish it in ONE WHOLE WEEK, I’ll never understand) I was completely unprepared to travel with it in my car on a long road trip and I was unprepared to sleep with it in my cabin 2 nights in a row. This refreshes two lessons for me. I need to plan snacks and meals that include these foods I have deemed as “special.” My list includes, peanut butter M & M’s, Trader Joe’s Peanut Butter pretzels, toffee, popcorn, and dark chocolate. As I look toward the rest of my week I am going to plan to have a couple of these as a planned snack. What are your special, glittery foods?